Texas ranks 6th in U.S. production. Grown on 16,000 acres and generates $90 million. State wide economic impact exceeds $134 million annually. The Lower Rio Grande Valley and Winter Garden plant early short day mild-flavored white and yellow granotype onions for market windows in March to June. High Plains and Far West Texas produce intermediate day onions for fresh markets and East Texas produces for local sales. 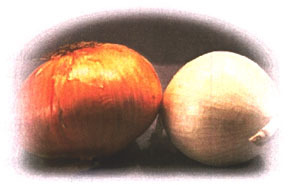 Onion breeding focuses on quality, earliness, shipping ability, and host plant resistance. Texas 1015 “super sweet” is one of the superior mild onions for consumers. Soil insects include white grubs and wireworms. Two thrips species damage foliage. Occasionally, onion maggot and cutworms cause damage. These insects can cause yield losses that can exceed 50% but can be controlled with insecticides. No varieties specifically resist insects but some varieties are less affected. Beneficial predators are commercially available for thrips but do not give dependable control. Diazinon, chlorpyrifos (Lorsban), and methomyl (Lannate) are three FQPA targeted products that, if withdrawn, could negatively impact the industry by 25% in yield reduction and quality losses. There are no commercial replacements for diazinon for soil insects or methomyl for western flower thrips. Chloropyrifos is the only effective control for onion maggot, with no alternative chemicals. Foliar fungal diseases include leaf spots such as Alternaria, Botrytis, and downy mildew. Soil borne diseases include pink root. Some varieties tolerate pink root fungus; rotation is recommended for suppression. Leaf spot diseases are partially alleviated by thinner spacings. No biological controls are available. Current studies show limited success. Chlorothalonil (Bravo), iprodione (Rovral), and dithiocarbamates (Maneb and others) are the three major FQPA targeted products that, if withdrawn, could reduce yields by 50%. There are no commercial replacements for these products but azoxystrobin (Quadris) and propiconazole (Tilt) are being tested and are expected to receive limited labeling. Problem weeds include broadleaf weeds such as ragweed and pigweed, annual grasses, and perennials such as bermudagrass and yellow nutsedge. Field rotation and mechanical cultivation are practiced. Bensulide (Prefar) is the only major FQPA targeted product that, if withdrawn, could reduce yields by 20%. Currently, there are no commercial replacements but partial replacements include trifluralin (Treflan) and metolachlor (Dual). These products can cause some phytotoxicity. DCPA (Dacthal) was recently removed from the market. Crop breeding continues to provide improved cultivars. Pesticides are essential to sustain production. Use is based on scouting, pest presence, and marked quality expectations. Crop Briefsis an information series developed by Texas A&M AgriLife of the Texas A&M University System on critical pest problems and pesticide needs for Texas agriculture. This effort is supported by the South Texas Onion Committee, and other commodity groups. Dr. Dudley Smith, Texas Agricultural Experiment Station and Dr. Juan Anciso, Texas AgriLife Extension Service prepared these reports August 2000 using information from numerous sources. Departmental Report SCS-2000-01.The information given herein is for educational programs only. Reference to commercial products or trade names is made with the understanding no discrimination is intended and no endorsement by the Texas AgriLife Extension Service and the Texas Agricultural Experiment Station is implied.